This location has passed through a lot of hands. This is the second oldest brewery in the USA and the oldest in Wisconsin dating back to 1845. I have been to three brewery tours all of which were during the time of the Joseph Huber Brewing Company ran the show. See the URL's below for a bit of this brewery's history. We are pleased to express that Minhas Craft Brewery is definitely serving up some really fantastic sodas under the Blumer names. The Berghoff Beer name has gone away from this location and with the exception of the Huber beers, Minhas Craft Brewery is producing some [may I preface this with a disclaimer that these are my expressed back-handed complimenting opinions] above average inexpensive lager style high grade regional macro brews (what some might consider to be swilly). 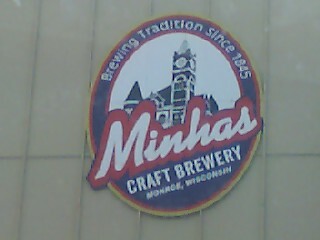 The Minhas selection of brews is possibly more tasty than their northern Wisconsin rival at Jacob Leinenkugel Brewing Company in Chippewa Falls, WI but maybe not. This location lost their name in 2006 from Joseph Hubor Brewing Company and is now run by a previous contact brewing Company - Mountain Crest Brewer "Damn Good Beer!" owner Ravinder Minhas.